1) Organizing: You can print a cover page or simply add the title and instructions with a permanent marker, that way you can keep your centers organized by theme, skill, unit, etc. It also helps you to know what goes where, if activities are misplaced when used, etc. 2) Easy to find: When you introduce your manila-envelope center, tell the students to read the title when choosing the activity. I also try to print my centers in colored paper to help students distinguish from different activities. Then tell them to put it away inside the same envelope when they are finished. It is important to introduce this step for better functionality. After the center activity is introduced and you have several activities for kids to choose from, kids will automatically find their activities without your help. 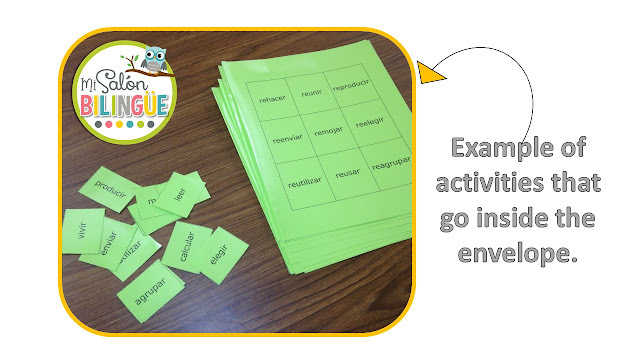 3) Reusing: Laminate your center activities and plan to place each activity in a separate envelope; for example: Nouns would be one envelope, Proper Nouns would be another and so on. Laminate the envelope too (empty and open with glued cover page). You can use them year after year. Yes, some will tear apart after some use, especially if they are bulky or the activity is hard to get out (keep them simple), but the work and cost of replacing the envelope will be less than printing the whole thing over and over. Some others will last for years! 4) Set up: The first time you do this, could be time consuming (like all related to classroom management! ), but think about investing time once and setting up centers smoothly for years! It’s a great investment, don’t you think? 5) Storage: Because manila envelopes use very little space, it is almost needless to say that storing these centers is very easy. At the end of the year I put them all in a big plastic container and keep them locked in my classroom cabinet or take them home when I need to replace/add parts. 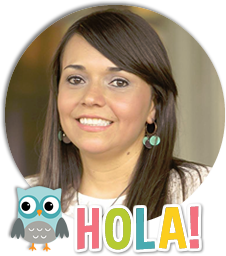 I offer some 2nd grade ideas and resources in Spanish on my [TPT] store that can work great on some of your literacy stations. Feel free to take a view on my [RESOURCES].